The vineyard with the dubious reputation of giving birth to the German export phenomenon of Liebfraumilch is again building its reputation for top quality. Liken the situation to Cheddar cheese, which started life in a small village called Cheddar in Somerset, but became so popular that it began to be made anywhere, still under the name of Cheddar. Cheddar effectively now means hard cheddar-style cheese from anywhere. But the original Cheddar cheese has fought back to reclaim its origin, and quality credentials, in the form of European Union PDO (protected designation of origin) status for West Country Farmhouse Cheddar. It has had this protection and guarantee since 1996. 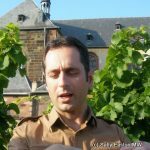 So it is with the single vineyard of Liebfrauenstift-Kirchenstück in Worms, Rheinhessen. This small vineyard, with a heritage of vine cultivation going back half a millennium, was the birthplace of what become known as Liebfraumilch. It is now fighting to restore its reputation. Since the late 15th century the gothic Church of our Lady (Liebfrauenkirche) in Worms became an important stopping point along the pilgrim route to Santiago di Compostela in north-west Spain. Worms had already long been an intersection for trade routes following the south-north flow of the river Rhine and those going east and west, needing to cross the river. 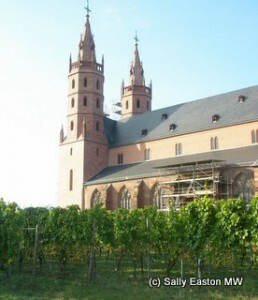 Wine from vineyards surrounding the church, and monastery, which had been on the same site, grew in reputation. And the legend from the 1600s has it that the wine tasted as sweet as the milk of our Lady (liebfrauenmilch). The church’s Madonna statue, whose image was long a familiar sight on labels of 20th century Liebfraumilch, was originally carved in the latter part of the 15th century, when the Church of our Lady was finished. She now takes her place at the edge of the vineyards, from which fruit the original, vineyard-specific, wine was made. However there’s no record of the grape varieties used to make the original Liebfraumilch. The estate is now owned by Wilhelm Steifensand, seventh generation of the founder of the Valckenberg company, which started exporting Liebfraumilch wines in the 1800s. Export impetus was increased in 1840 when Britain’s Queen Victoria married Prince Albert of Saxe-Coburg-Gotha and decided have white wine for the lunch. Liebfraumilch became exported the world over, including China, in those days of British Empire. At this time in the 19th century there were no wine estates in Germany, which, today, make wine from delimited vineyards. There were famous vineyards with people producing wines in those famous vineyards, much like, for example, the famous vineyards of Burgundy today. And there were no production regulations, so that by the turn of the 1900s Liebfraumilch was very popular, being made under that name using grapes coming from a much larger vineyard area than the original. Production, under the name Liebfraumilch, had spread along the Rhine, losing any link with the original vineyard. So, by the time of Germany’s wine law of 1909, Liebfraumilch was designated a regional wine, rather than a vineyard-specific wine. Then the infamous 1971 wine law made it an even larger regional wine, able to be produced in the Pfalz, Rheinhessen, Rheingau and the Nahe. By the post-second world war period the wine Liebfraumilch bore no relationship to the original vineyards and had become a fruity-sweet style, uncomplicated and easy to drink. The Liebfrauenstift estate, just 14 hectares in size, no longer has anything to do with Liebfraumilch, and indeed, is working towards VDP status, which recognises first growth level vineyards. Winemaker Tilman Queins, who took over at the now-city vineyard in 2001, makes three categories of wine from the single vineyard Liebfrauenstift-Kirchenstück estate, still overlooked by the Madonna. The wines are made from riesling. This article was inspired by a Master of Wine group visit to the producer in September 2009.